Do you smile with confidence? If you can’t, your teeth may need a little cosmetic help. 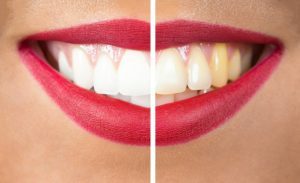 Teeth whitening from your cosmetic dentists in Oklahoma City, Dr. Colin Holman and Dr. Jon Holman, improves tooth color by six to 10 shades. You can use this cosmetic dental service right in the privacy of your own home or have it done in just one visit at OK Dental Expressions. Professional teeth whitening gives patients with dull, yellowed enamel an effective and safe way to remove years of dental stains. Using highly-concentrated hydrogen peroxide gel, professional whitening lifts discolorations out of enamel without causing any tooth and gum sensitivity. While there are many over the counter whitening products (strips, rinses and toothpastes), nothing works as well as whitening treatments from OK Dental Expressions. Plus, professional whitening features many benefits. For instance, Dr. Holman will make sure your teeth and gums are healthy enough for whitening, and he supervises your cosmetic dentistry treatment plan to ensure your complete satisfaction with the results. While limiting these foods and beverages reduces discoloration, time has a way of deepening stains as organic matter (plaque and tartar) accumulate on teeth. As such, neglected dental hygiene changes tooth color. Just call OK Dental Expressions to set-up a cosmetic dentistry consultation. The doctor will examine your smile to ensure your mouth is healthy enough for teeth whitening. He will take an oral impression to make acrylic trays that precisely fit over your top and bottom teeth. These trays apply your whitening gel at home. Dr. Holman will instruct you to wear the gel-filled trays for a prescribed amount of time every day. The trays put the powerful gel just where it will do the most good. After one to two weeks, your teeth will appear amazingly brighter. As an alternative, you may opt for fast in-office whitening. With this treatment, the dental team applies a concentrated peroxide gel right to tooth surfaces. The gel seeps into the enamel and bleaches stains in just about an hour. When the gel is rinsed off, a dazzling, bright smile remains. Just think of it. You can have a white smile again. Simply contact OK Dental Expressions to arrange a cosmetic dentistry consultation. Dr. Holman will tell you if professional teeth whitening is right for you.